John McLusky drew for the Daily Express James Bond comic strips between 1958 and 1966. He returned to Bond in the 1980s to illustrate some original 007 stories by Jim Lawrence in the Daily Star. As his son Graham writes on his new website, "He worked very hard on every comic art strip & drawing, meticulous in every detail. He worked from a story script, provided to him on a sheet of typed paper, outlining each frame. John then had to visualise this and put it down onto art board." McLusky was able to give visual form to James Bond four years before Sean Connery defined the character for cinemagoing audiences and his portrait of Bond form 1965 is now iconic. 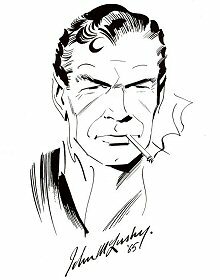 The new website jamesbondcomicart.co.uk celebrates the late artist who passed away in 2006 and offers a select range of print and original McLusky art for sale.